Eating pork while boozing at brunch is just a way of life around these parts. In fact, we've gotten so good at it, we've just combined the two into one glorious bacon-y vodka-filled beverage: the Bloody Mary. We asked the connoisseurs at BloodyBest to sort through skewers of pizza, pork belly, and grilled cheese, and power-rank Chicago's 10 most ludicrously stacked Bloody Marys. "You put tomato juice in a Bloody, add bacon and lettuce, and you've got yourself a drinkable BLT with no need for frilly toothpicks. This spicy number also comes with toast, but we had you at bacon, didn’t we?" "While taking down a rack of ribs at Smoke Daddy, sip on their Famous Bloody Mary topped with warm smoked brisket and pulled pork. If you come down with a case of meat sweats, cool off with a chaser of High Life." "For $5 at Rockit, you get a hearty mug of house-made Bloody mix and Absolut Peppar, then you choose your own adventure from there. The menu claims at least 18 garnishes and ingredients -- but the chart at the bar adds up to 30. Prepare to be overwhelmed by shrimp, ham-wrapped cheese, pretzels, hot peppers, pickles, olives… and the list continues." 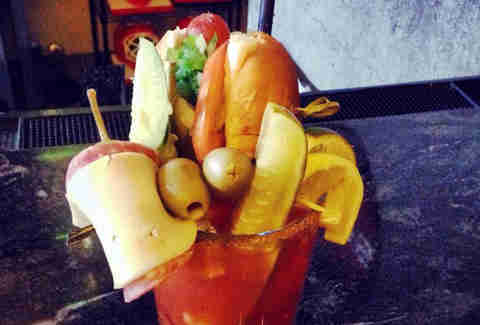 "Trust us on this one: choose Handlebar’s Bloody Hammer over the regular weekend Bloody special. 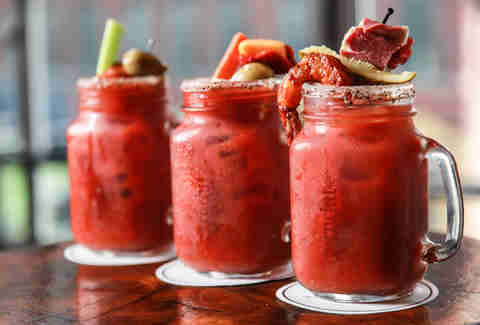 This one's made with house-made Bloody Mary mix, Stoli Citros, a splash of Guinness, olives, cherry pepper, and a fried pickle that's been soaked in boozy tomato juice -- it’s the stuff dreams are made of." 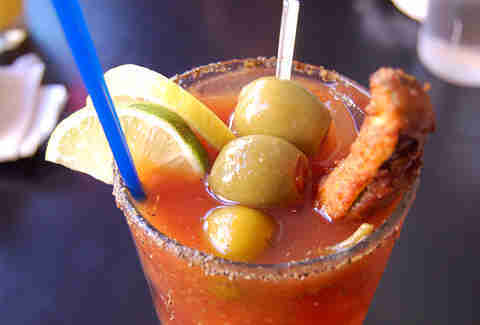 "More than a clever name and a pretty face, the Morning-After Mary clearly wins for garnish alone. 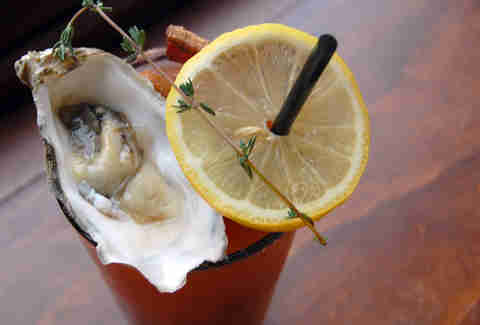 Has anyone else seen a Bloody Mary with an oyster garnish? Well you have, because you're looking at the picture, but nobody else. The smoky maple bacon, lemon slice, and rosemary sprig don't hurt either." 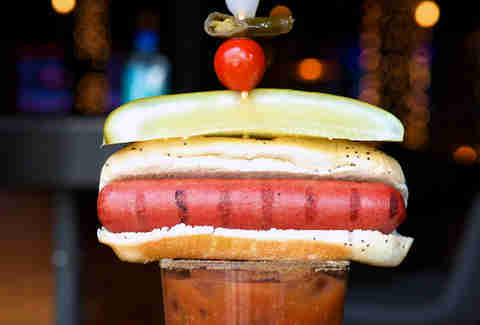 "We don’t do ketchup in this town, but who says your hot dog can’t swim in tomato juice? The Grid’s Bloody is a deconstructed take on the Chicago Dog with a poppyseed bun, peppers, onion, and tomato. Take that, New York, and your inferior hot dogs!" "It's proven science that cold pizza cures hangovers. 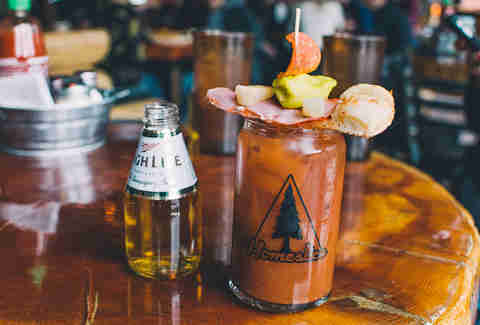 We’re guessing that’s the inspiration behind this Bloody Mary that comes complete with a cold slice of Hawaiian-style pizza, pepperoni, pepperoncini, and a Miller High Life pony." "Jimmy Green’s combines both of our city’s loves (hot dogs and sports) with a mini-yet-mighty Chicago-style dog atop its Bloody. This will make those early morning World Cup matches (and watching soccer) tolerable." "Chances are, you’ve made a late-night stop at White Castle in a Harold & Kumar state of mind. 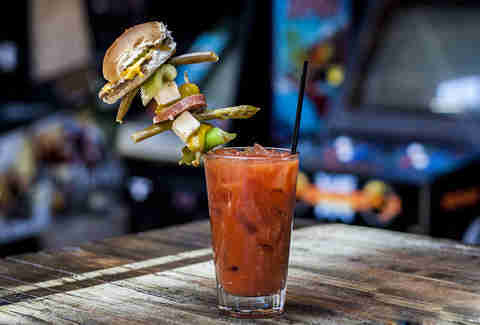 Headquarters Beercade will make you forget you ever forgot your cell phone at home with this Slip N' Slider, an insanely garnished Bloody Mary with a stack of meats, cheeses, veggies, and a White Castle slider. 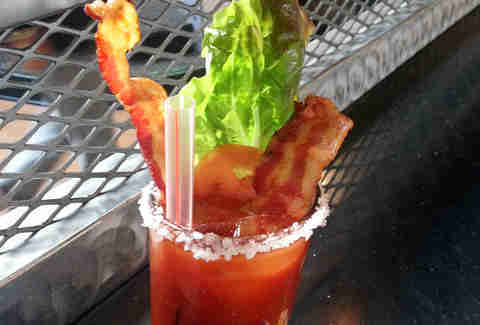 The Crave Case-version of a Bloody Mary." 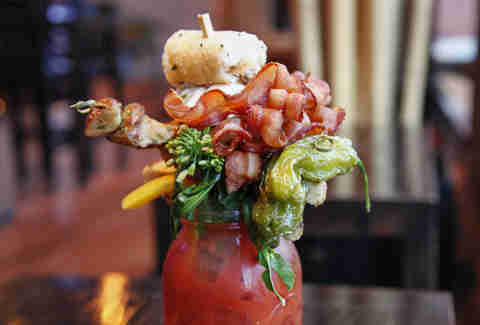 "Good luck wrestling the city's most ridiculous Bloody Mary. 32oz of Bloody mix and Absolut Chicago vodka (distilled Ditka sweat?) in a mason jar, boldly garnished with: Chinese broccoli, loompya stick, herb-roasted potatoes, Oshinko, tocino grilled cheese, baked snow crab hand roll, duck bao, braised pork belly, and three slices of bacon. Come for the vodka and tomato juice, stay for the Chinese buffet perched on top." 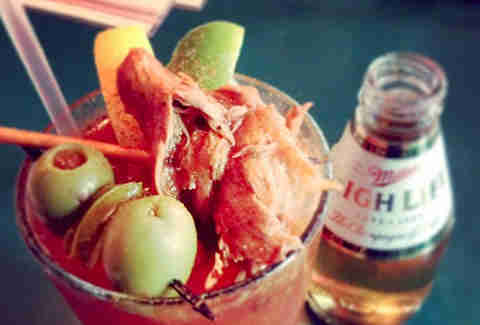 Follow Elaine and Amber on their quest to consume all the best Bloody Marys in Chicago at BloodyBest.com. Sean Cooley is the former Chicago Editor at Thrillist, and he lives his life by Anthony Kiedis lyrics. Follow him @SeanCooley.